It's more obviously in the roots of Brazilian jiu-jitsu, (BJJ) artists who practice an art originally brought to Brazil by KODOKAN Judoka Mitsuyo Maeda. "A JUDOKA USING JUDO THROWS IN MMA"
A Judo throw is a judo throw, and a handle is a handle. In Sport Judo generally a Judo GI is used to throw your opponent but not always. 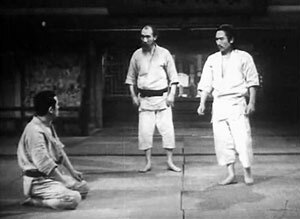 (JUDOs origin is jujutsu/Yawara) The Samurai developed jujutsu for combat in the battlefield and they didn't wear a Judo GI, it didn't matter whether they grabbed an Arm, Head, Ear or Battle Armour etc... these throws were developed to apply the technique with any kind of handle or grip. "Sent by the KODOKAN to introduce Judo to the World was a man named (Mitsuyo Maeda)" aka Conde Coma the man who taught Carlos Gracie Judo, which gave birth to Brazilian jiu-jitsu. Maeda would fight anyone with or without a GI, the results were the same, you got thrown and submitted. "KODOKAN KOHAKU SHIAI STYLE CONTEST": (In this case, better known as a SLAUGHTER LINE!!!) Conde Koma will challenge three men per night. If he can't defeat them in three minutes each, the challengers can split "$500" A whole lot of money back in 1911. Of course no one ever collected! CLICK HERE: TRAIN LIKE AN OLYMPIC LEVEL JUDOKA. See how two time Olympian "Travis Stevens" trains.